The first part of the year is traditionally a bit of a cinematic wasteland, a barren stretch of a release calendar filled with movies that would qualify for a Razzie long before an Oscar or Golden Globe. Sure, there’s Sundance in January, and some nominated films see wider U.S. releases in February. But generally speaking, it isn’t until May that things really improve, as early summer blockbusters make their way into the world. 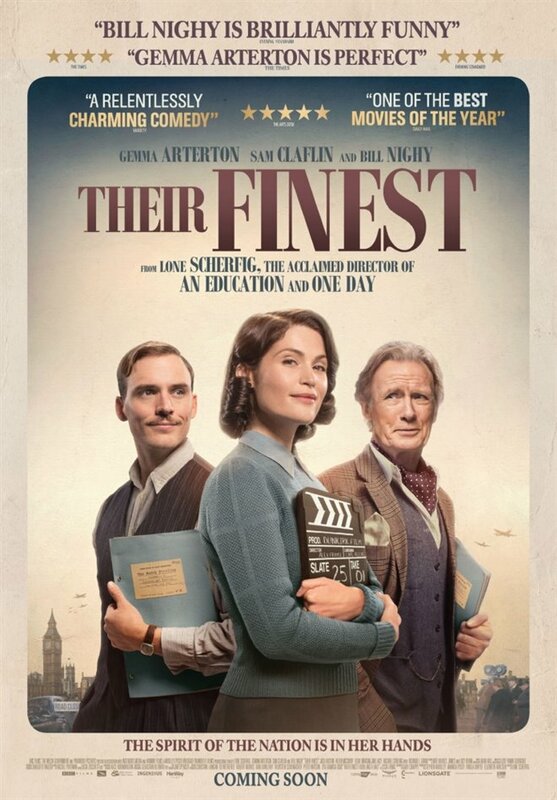 It’s that context that makes a gem like THEIR FINEST, opening barely halfway through April, all the more enjoyable. In a sea of mediocrity, it’s well worth the trip to the cinema this month before they’re overrun by superheroes and action adventures. Set in London at the start of World War II, it’s the latest adaptation from An Education director Lone Scherfig and features a who’s who of British ensembles: Gemma Arterton (a Bond girl in Quantum of Solace), Sam Claflin (Hunger Games), Bill Nighy, Jeremy Irons, Jack Huston (Boardwalk Empire), Eddie Marsan, Helen McCrory…and American Jake Lacy (Miss Sloane) for good measure. Though based on a 2009 novel by Lissa Evans, Their Finest Hour and a Half, one would be forgiven for thinking the film recounts a true story of war-time technicolor propaganda, as a studio scrambles to produce a galvanizing epic based on the retreat at Dunkirk. Arterton’s Catrin Cole – Mrs. Cole – is called into the studio offices after Tom Buckley, their head writer, sees her clever newspaper comic. They need new, and particularly feminine, eyes on their scripts. After all, their most captive audiences are the war wives left behind, and so far, the short films encouraging rationing and explaining bomb shelters and so on are wildly off base if they ever hope to connect with these women. Though grating to hear in 2017 (and worse, to hear all the white, male press guffaw at them), the film’s early scenes of blatant sexism (“Mrs. Cole, of course you can’t be paid as much as the chaps, will two pounds a week do?” “Should we also employ a dog to write the barks?”) make their point: we aren’t in 2017, and Mrs. Cole certainly has her work cut out for her. She’s soon at it as Buckley points out a story in the papers: twin sisters who stole their father’s boat to help the retreat from Dunkirk. Mrs. Cole is sent to scout it out for a possible adaptation. With a struggling artist for a husband and rent to pay, she fudges a few of the details to get the green light on the project. She and Buckley set to work on drafting a script that checks every box: effective and optimistic, with the Crown on the right side of history. Add an American, if you might, for our friends across the pond. Novels have a way of expanding the world on the page far beyond what a film can show on screen. So it’s understandable that this relatively straightforward plot ultimately weaves in various storylines it would take too long to get into here – an over-the-hill actor and his agent(s), the artist and his infidelities. Suffice it to say that Sherfig and screenwriter Gaby Chiappe deftly weave it all around Catrin’s journey through the unpredictability of war and, you know, navigating the workplace as a woman. As lead scriptwriter and his girl Friday, Claflin and Arterton, each brimming with an individual charisma, channel that sharp dynamic with such chemistry they might just rival Cary Grant and Rosalind Russell. Even in tense moments, there’s a connection between them that finds one missing them when they’re not on screen. Though Bill Nighy, that reliable scamp here as a has-been with an ego ever in need of stroking, does quite well to make up for it. In the end, Their Finest is a war picture right out of the 1940s, and that Scherfig channels that era so well is perhaps the most notable achievement of all. The movie within the movie has to get finished, despite – or perhaps in spite of – the air raids and the advancing Germans. It’s their duty to the war effort, just as important as the boys on the battlefield. But war takes its toll on the patriotic crew, and by the time “The Nancy Starling” premieres, none of our ensemble are quite the same as when we began. It’s in this journey that Their Finest shines…well, quite finely. Film, as Buckley tells Catrin early on, is real life with the boring bits cut out. Their Finest succeeds by adhering to just this formula, not a single character, scene or exchange a drag in a film that’s at once a rallying cry to the home front and a celebration of great storytelling. Though it may not ascend to the heights of acclaim found by An Education, it would only be because people won’t be paying enough attention, eager as they are for those summer blockbusters in the next few weeks. For surely, it’s not because Their Finest isn’t deserving of it.